Congratulations, friend. You are finally making good on that resolution to get organized or you are ready to upgrade your current skills to Master’s level. Maybe your handwriting is so atrocious that no one in your office, including yourself, can read what has already been labeled. Better yet, your home management requires A+ work because your kids and partner make a mess of everything! Whatever your needs, the most predominant one is this: it’s time to purchase a label maker. In a world of everything-at-our-fingertips and internet shopping, how is a person to choose? We’ll tell you – just take a little peek below to see all your most nerve wracking questions, answered. If ever there were a label maker for both the organized and the artistic/crafty crowd, this is the one. The PT-D 200, made by Brother, packs a whopping 80 characters per label into its punch. With eight adjustable fonts, 600+ symbols and 95 different frames, your imagination and creativity can run wild. The PT-D 200 even comes with a “deco mode” allowing the user to design frames in different colors and with pictograms. Label tapes come laminated with easy peel and stick backs as well as fabric for iron-on purposes. Tapes are designed to resist water, grease, fading and abrasion. Users have reported being able to effectively use labels in the freezer, microwave, dishwasher and laundry as well as indoors and outdoors. According to Amazon.com 74% of users rate the PT-D 200 with four to five stars. Are you intrigued yet? Is your mind leaping with joy at all the possibilities? Allow me to indulge you even further. The labels: As previously mentioned labels come with stick and peel backing and in laminate and fabric material. Laminate tapes also come in extra-strength adhesive and flexible ID styles. Label tape comes in a variety of widths – 3.5mm (.13”), 6mm (.23”), 9mm (.35”) and 12mm (.47”). Each label can be printed with one to two lines of text. Laminate tape background color comes in multiple varieties from classic white to pink, green and blue (and then some). Font colors also come in a variety of colors from standard black to red and yellow. Fabric tape comes with blue font on a white label. Onto more details about the machine itself! The maker: Weighing in at 1.1 pounds and measuring 6.1” x 6.5” x 2.7”, the gray and white PT-D 200 is easily held in two hands. It could also fit in a desk drawer for storage or be portable in a backpack or larger handbag. A QWERTY keyboard makes it easy to punch in the letter details of the label, much like texting on a phone. Specific menu, font, frame and symbols button sit above the keyboard. The PT-D 200 can save up to 30 of your favorite labels for future re-printing. With a graphic display you can preview your labels before you print. Easy shortcuts are listed on the back of the labeler to avoid constant referencing to the user manual. The maker is powered by six AAA batteries though an AC adapter can also be purchased. “What about costs?” you ask. “Give me the nitty-gritty!” you say. The price: As usual prices range by website and in-store purchases. As of the writing of this review, Amazon.com listed the PT-D 200 at approximately $53 with its Prime Membership. Staples.com listed the PT-D 200 at a lower $40 (presumably with extra shipping). In store prices will vary depending on location and sales. Label prices vary wildly dependent on website as well as type of label. For example, fabric labels price between $20-$33 for 9.8 feet of length while basic laminate prices vary between $11-$14 for 26.2 feet. Purchasing an adapter to use instead of batteries, will run between $20-$35. 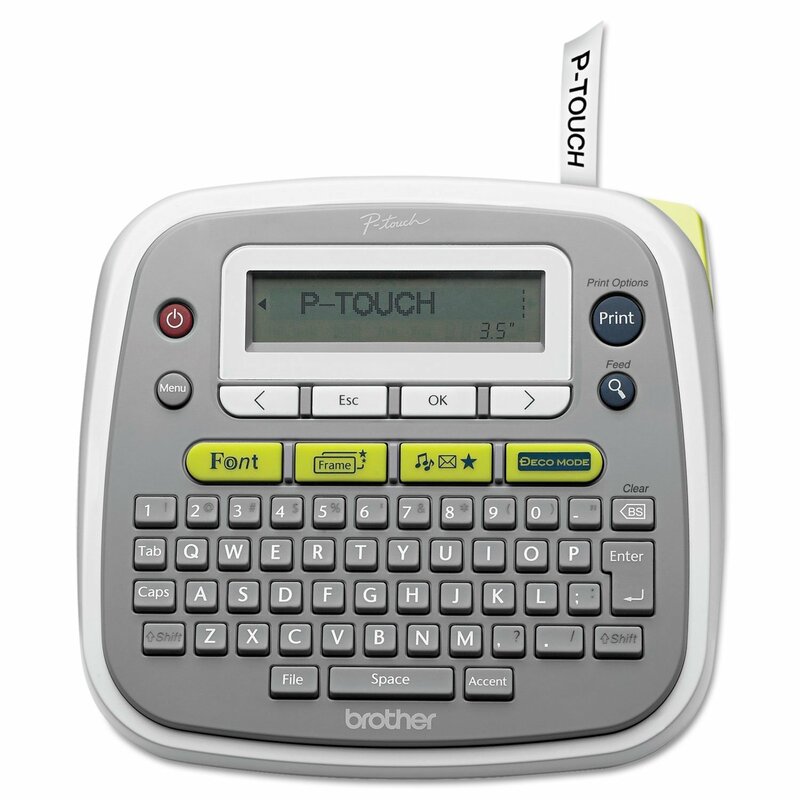 The extras: The Brother PT-D 200 comes with a one year warranty and free internet and product support for the life of your label maker. You can register your label maker on Brother.com. There is no need to connect the labeler to your PC or laptop as it prints all on its own. Be mindful: You must purchase labels and batteries separately! These typically do not come with the purchase of the label maker itself. The PT-D 200 does not print barcodes. If you need a label maker for this reason, continue reading to other options below. The PT-D 200 does not connect to your computer. If you want to be able to access your computer fonts and styles, you will need to look at another product. Again, see below. A close second is the Epson LW-300 label maker. Holding steady with 14 fonts in 10 different styles, 300+ symbols and 75+ frames, the organized and the craftsy alike could fall in love with this label maker. The LW-300 also has specialty labels in multiple colors. Label tape comes with split backing adhesive for ease of use. Users report label cartridges are easy to insert and the product itself is relatively quiet. According to Amazon.com, 84% of users give the LW-300 a four or more star review. Epson.com reports that Scrapbooking Beyond gives the LW-300 an A+ review. The labels: hold onto your hats for this one because the LW-300 comes not only with its standard laminate labels and fabric tapes, including pearlized and clear, but also with glow-in-the-dark and reflective tapes! Just imagine what this label marker could have done for your black-lighted teenage years. (This writer sighs with deep content in the imagining of it). Anyway, these label tapes also come with your choice of background and font color. You can purchase standard black writing on white background or go for vibrant with black lettering on pink or red backgrounds. Dozens of multi-color options are available. These labels also employ smaller margins with their tapes, meaning less waste for the user. Tapes come in multiple widths from 6mm (1/4”) to 9mm (3/8”) and 12mm (1/2”). Length of tape rolls is 30 feet. This tidy little machine looks as sleek as it sounds. The maker: With a black on white design and a splash of green highlighting the printer, the LW-300 is appealing to look at. Weighing in at 14.1 ounces and measuring 5.9” x 5.7” x 2.2”, the LW-300 is also easy to hold in 2 hands. QWERTY keyboard makes typing as easy as texting. An LCD display allows you to preview your label before you print it. The LW-300 can save 30 files to memory. It can also print in mirror images and seven different languages! Choose from English, Spanish, French, Brazilian Portuguese, Italian, Dutch and German. Six AAA batteries power the LW-300 and a battery level indicator light on the model tells you when to replace, though an AC adapter can also be purchased. This label maker needs no computer as it is a stand-alone print operation. Onto the influence this pretty little piece will have on your wallet. The price: As usual, prices range from website to website and among stores. 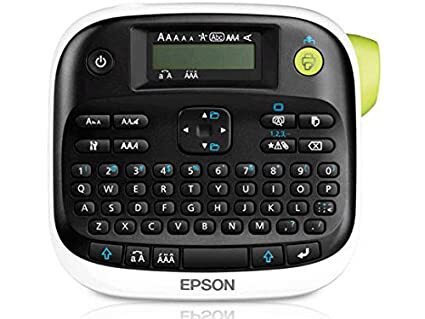 As of the writing of this review, Amazon Prime listed the Epson LW-300 at $20 through its Prime Membership while Epson.com listed the label maker at $40. Refill cartridges appear to range from $19-$25 apiece per 30 foot roll. The extras: Epson.com reports that the LW-300 comes with a warranty card, though the specifics are not mentioned. The LW-300 is small enough to fit into a desk drawer and be carried in a larger bag. Last but not least, don’t forget these tidbits about the LW-300. Be mindful: Batteries and AC adapter come separately. Double check to see if the package comes with label tape – this may or may not be reflected in the price of the product. Refill cartridges will be needed quickly, if not right away after purchase. The LW-300 does not connect to PCs and laptops. If this is an option you want, continue to read below. The DYMO label manager, while coming in at 3rd place, still manages to hold its own with its portable design and rechargeable INCLUDED batteries. (Be still, my heart!) Additionally, Label Manager 280 can easily connect to your PC or Mac through your USB port if you want to use your computers fonts. This specific product produces labels 50% faster than others from the same maker. It carries six font sizes, seven text styles, eight boxes and 220 symbols and clip art. Tape comes in a variety of colors. And guess what – the DYMO label manager 280 prints barcodes! Label tapes come with split-back easy peel adhesive. 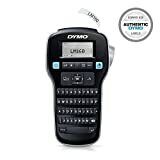 85% of user reviews on Amazon.com give the DYMO Label Manager 280 a four to five star review. The labels: DYMO offers label tapes in ¼”, 3/8”, and ½” widths. Each cartridges sells in lengths of 23 feet. Background colors include clear, white, blue, red, yellow and green. Unlike the other label makers listed above, the Label Manager 280’s tapes must be cut manually from the product. The maker: In a black, paddle-shape with a QWERTY keyboard the Label Manager 280 is handheld and portable. Above the keyboard a number of buttons (including On, Print and Menu) are touch-sensitive virtual rather than physical. Some question remains about the exact dimensions as Amazon.com lists the product as measuring 2”x 8”x 4” and PCMag.com lists it at 3.5” x 7.5” x 9.4” (HWD). The same thing occurs in its weight with Amazon reporting 1.4 pounds and PCMag reporting .9 pounds. A small selection of user videos on YouTube may provide some more clarity on this. Some listing agents also provide pictures of the label maker in use. The Label Manager 280 can save up to nine labels for future needs. A preview screen allows for more effective printing. Connecting to your computer greatly increases this label maker’s potential as it can also print computer based fonts for its labels. In order to do so, simply download the software from the site listed in its User Guide. This is also easily found by navigating DYMO.com. The included battery is lithium ion and rechargeable. Amazon.com also sells AC adapters for this model. 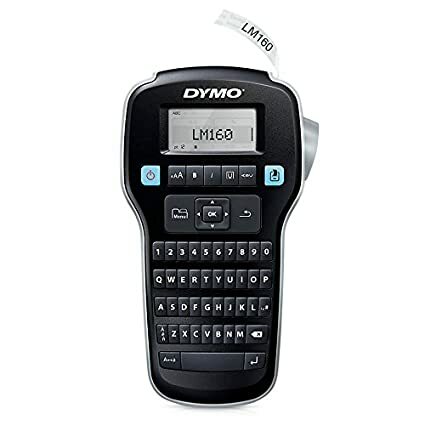 The price: Depending on what add-ons are included in the packaging, the price of the DYMO Label Manager can run from around $28 (on Amazon.com) to $68 (on DYMO.com). “What?” you exclaim, “that’s madness!” Well, keep reading and you will soon see why. Additionally, label refill cartridges range from $10-$20 as well on these respective websites. The extras: One year limited warranty. Be mindful: Depending on where you purchase this item, different add-ons are incuded. For example, if purchase on the DYMO website, the package includes a USB cable, an AC adapter, a rechargeable battery pack and one label cassette (hence the significany price difference). This is not necessarily true for Amazon.com. Also, the DYMO Label Manager’s screen is NOT backlit. This could make it difficult to see for some. 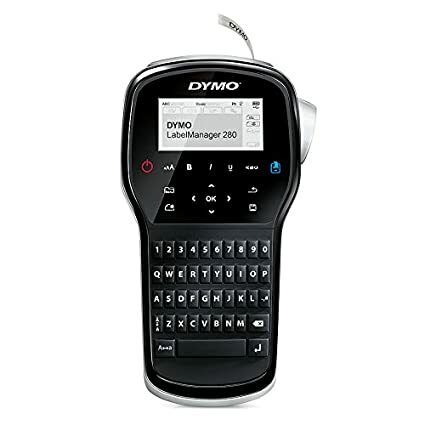 As opposed to other models, the DYMO Label Manager 280 does not have specialty labels. No iron-on fabric, extra strong adhesive or reflective tapes. Lastly, for those of us who just want an easy, functional, affordable option there is the DYMO Label Manager 160. I mean, really, all those choices and customizable options just take up precious time that could be spent in our happily organized life rather than in the attempt to make it so! Still, the DYMO Label Manager comes with six font sizes, eight text styles and over 200 symbols. Labels can adhere to clean, flat surfaces including plastic, metal, wood, glass and paper. 77% of Amazon user reviews rate the product with four or more stars. The labels: D1 standard labels come in three sizes: ¼”, 3/8”, and 1/2”. Twelve different background and font colors are available for purchase from black lettering on white background to red lettering on clear tape. Colors are basic – black, white, red, green, blue and clear. Tape backing peels off when ready to adhere. No messy residue left behind when removing the label. The maker: Easily hand held and in a sleek black and silver combo, the DYMO Label Manager weighs 1.2 pounds and measures 2.3” x 4.5” x 8”. Six AAA batteries (not included) power this label maker. A preview screen shows your pre-printed label. QWERTY keyboard makes it easy to type up your labels. The price: For 23 feet of tape, DYMO Label Manager 160 refill cartridges can be purchased for $20 on Dymo.com or about $9 on Amazon.com. 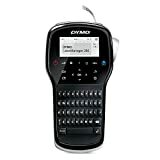 For the Label Manager 160 itself, you can expect to spend between $10 (Amazon) and $38 (Dymo). Be mindful: Batteries and label tape purchased separately. As with our previous DYMO product, carefully read what is included in your purchase as the DYMO website may include more than a place such as Amazon. If you are still feeling confused or overwhelmed about which product to purchase, below are some considerations and questions to take into account before you narrow down your choice. Ask yourself what is the label maker for? Is it an office, home organization or craft room? Are your labeled items indoors or outdoors? What material do the label tapes need to affix to? 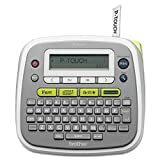 A list of possible uses for a label maker include file folders, school projects, cable wires, garden flowers, storage bins, food containers, shelving and clothing. Each of these listed would require specific types of tape cartridges. Be sure the label maker you choose offers these. Two categories of questions about user friendliness. 1) Who is going to use the label maker? An adult or a child? Multiple individuals or just one? Are they a natural organizer or do they need a little prodding in this direction? Does this individual have a love for all things color coded and organized by shape and size or do they just need to remember to put things back where they belong? 2) Who is going to read the labels? Will they be coworkers, family members or a customer? Are they younger or older? The answers to these questions can affect what kinds of colors, lettering and symbols you need in your label maker. A young child who needs to organize their toy bins may require colors and symbols until they are a competent reader. An older adult may require larger lettering. How frequently will your label maker be used? Are your intentions to keep paperwork organized such as taxes and important documents or do you need a total overhaul of your home or office? How often will you need to reprint saved labels for items such as children’s clothes? Due to frequency of use, where will your label maker need to be stored? Everyday use will likely require a portable label maker. Repeated print outs would need a label maker with better memory storage. Let’s get realistic: how much money is in the budget for a label maker? Keep in mind the questions you answered above. Additionally, remember you are not only purchasing the product itself but any add-ons, batteries and tape cartridges for future ventures. If you are using your label maker for a big project, you will need multiple refill cartridges. That can add up over time! After you have answered all the above questions, you will have more clarity about your needs. In a consumer culture it can be easy to go for “big and better” when really all we need is “simple and realistic.” If you’re anything like me, however, it will be easier to organize when you have a fun, crafty gadget to use. Read through the descriptions above as often or as little as you need. Most websites (listed below) also show videos of the label makers in use. YouTube can be a great resource for those of us who are more visual learners.